Sebastien Bourdais is congratulated after winning the pole Friday for Sunday’s IndyCar Series race in Phoenix. Sebastien Bourdais continued his hot start to the 2018 Verizon IndyCar Series season, winning the pole on Friday for Sunday’s Phoenix Grand Prix. The pole for Dale Coyne Racing with Vasser-Sullivan driver comes a month after he won the season-opening race at St. Petersburg, Florida. Bourdais averaged 188.539 mph for his two qualifying laps around the 1.022-mile oval. It was Bourdais’ 34th pole of his 13-year Indy car career. 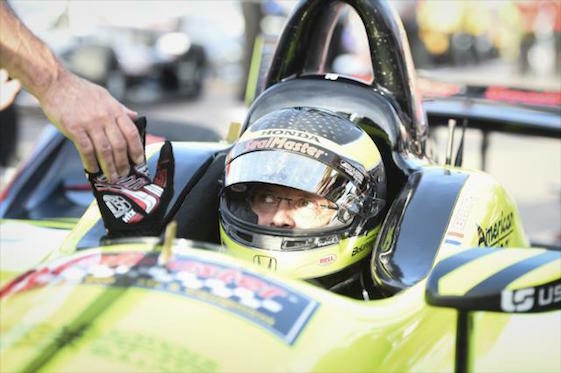 “We just have got a great group of guys working really hard, trying to make it happen,” Bourdais said. “When you do, it’s really sweet. A benefit of the being the championship points leader, Bourdais was last in the Phoenix qualifying order and ran in cooler conditions under the setting sun. It helped the 39-year-old from Le Mans, France, earn a pole position on an oval for the first time since Milwaukee in June 2006, when Bourdais was in the midst of winning four consecutive Champ Car titles. It was also the second pole in the 35-year history of Dale Coyne Racing, following Mike Conway at Detroit’s Belle Isle in 2013. Simon Pagenaud, last year’s race winner at ISM Raceway, qualified second with a two-lap average of 188.148 mph in the No. 22 Team Penske Chevrolet. Teammate and 2014 series champion Will Power was third at 186.852 mph. Alexander Rossi qualified fourth for Andretti Autosport in the No. 27 Honda (186.824 mph). Schmidt Peterson Motorsports teammates James Hinchcliffe and rookie Robert Wickens locked up the third row of the starting grid: Hinchcliffe qualifying fifth at 185.741 mph in the No. Honda and Wickens sixth in the No. 6 Honda (185.362 mph). Saturday’s 250-lap race will be the 64th for Indy cars at the historic mile oval outside Phoenix dating to when the track opened in 1964. It will air live at 9 p.m. ET Saturday on NBCSN and the INDYCAR Radio Network.